Girl Scout Cookies and Wine? It’s Girl Scout cookie time! This is the time of year when all your New Year’s resolutions about losing weight take a slight break when that cute little Girl Scout in your neighborhood asks you to buy cookies! Seriously, how can you say no to a young girl learning about marketing, money management, people skills and entrepreneurship by selling these cookies? They are SO good and everyone has their one favorite…or two…or THREE!!! Two years ago a friend posted a Girl Scout cookie and wine pairing photo on my Facebook wall. I was getting more and more into wine and food pairings and I had a good laugh at the photo. Girl Scout cookies and wine? I wasn’t so sure. But the thought was tucked away in my mind and this year I decided it would be fun to try it out. First I did a little online research. Sure enough, most of the information I found was based on the photo my friend had shared with suggestions to pair Samoas (chocolate and coconut cookies) with Rioja and Trefoils (butter cookies) with champagne. Sounded simple enough. Then one afternoon I was at a food and wine event at Perry’s Steakhouse and asked their corporate sommelier, Susi Zivanovich what she would suggest. She said to go with dessert wines like port, madeira and something I had never tried before…sauternes. Next, I found an article in Food & Wine magazine pretty much debunking all the pairings I had originally come across. They also agreed with Suzi about the dessert wines. And I figured since it was Food & Wine magazine, they should know! Riesling – Savannah Smiles were the overwhelming favorite of all cookies and wines. The Dry Riesling and lemon cookies pairing was so good everyone went back for more! 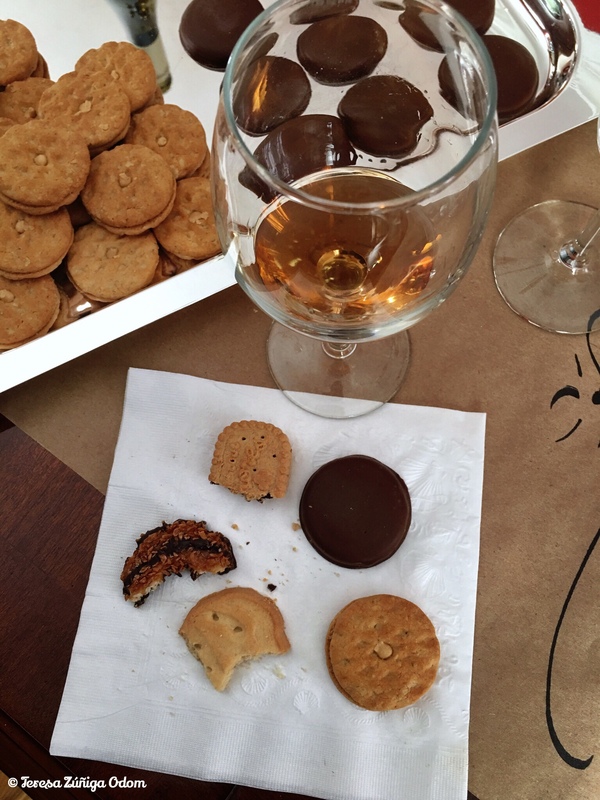 Moscato – There was a tie between Trefoils and S’mores and personally I liked both of these cookies with the Moscato. I’m not a big Moscato fan so this surprised me! Sparkling Rose – only one person really liked pairing this wine with the Savannah Smiles which proved the Food & Wine article was right about champagne. On the other hand, everyone enjoyed drinking the champagne when the tasting was over. Sauternes – Hands down the Samoas won with this suggested pairing. Was it the coconut or the chocolate? For me I think it was the coconut and the fact that this was a really sweet wine so I think the coconut balanced it out. Madeira – I paired this with both types of peanut butter cookies and everyone preferred the chocolate covered Tagalongs with the Madeira. So…this lead me to believe any of the chocolate cookies would work. S’mores for me was a close second even though I didn’t officially pair this one with the Madeira. Tawny Port – This is the wine that had the most suggested pairings, four total. Again, the Tagalongs (with chocolate) were a hit and tied with the S’mores (also with chocolate). 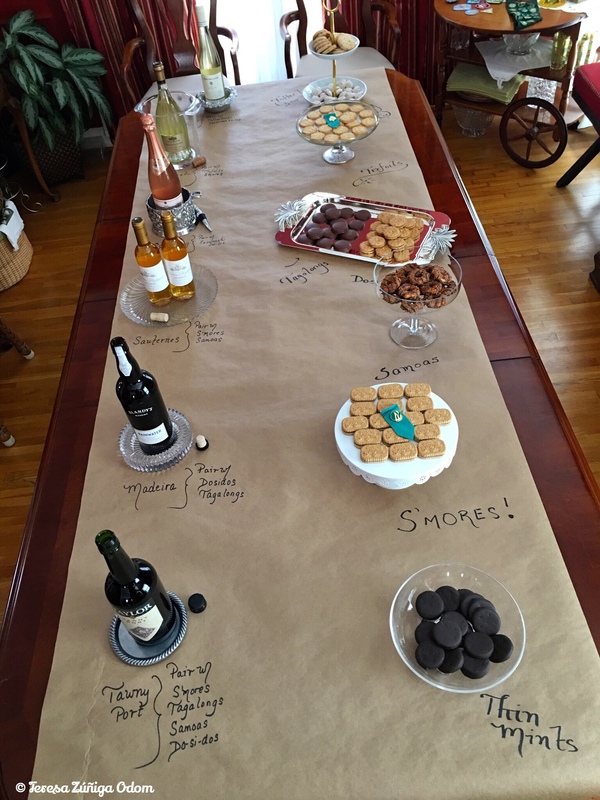 EXTRA WINE PAIRING – I have to add that one of my guests brought a white blend wine, Pine Ridge Chenin Blanc & Viognier, to try with the peanut butter cookies. She had gone to Vintage Wine Shoppe and they suggested this pairing. FYI – this was the place where I bought the Madeira wine. We added it to the table and both cookies paired really well with this wine! Last but not least…the thin mints…these are probably one of the most popular Girl Scout cookies but the thought of having wine with a thin mint didn’t seem like a good idea to me. The mint flavor was sure to overtake anything that we tried. In fact, I don’t think I saw anyone try the thin mints at my pairing. I know, I didn’t try to pair them, and I believe the Food & Wine article suggestion was to put these cookies next to the coffee! Now THAT’S the perfect pairing! Hubby even got into the tasting! Photo opp with Dawn and Marlene! Enoying some sparkling wine after the tasting. This paired well with the appetizers I served! I’m thinking about making this an annual event at my house. Several friends are already saying they’d love to be included and I love planning a good party! Meanwhile, if you are interested in trying out any of these pairings, you need to go ahead and get your cookies during the month of March! In the Birmingham area, you can reach out to Girl Scouts of North Central Alabama and click on the cookie link for further information. Or you can click on the “Find Cookies” button and enter your zip code to find out where booth sales are taking place. And if you are sticking with your losing weight resolution, remember that you can freeze the cookies until you are ready to give these pairings a try. A personal note about Girl Scouts…I was a Girl Scout when I lived in Puerto Rico. My mother was my Brownie leader and I went all the way up to one year as a Cadette until we moved to Chicago. Both of my daughters were in Girl Scouts and while I helped out a lot with my older daughter’s troop, I was my younger daughter’s troop leader from 1st through 12th grade. I served as Hoover Valley Service Area Manager for five years and also on the board of Cahaba Girl Scouts (now Girl Scouts of North Central Alabama). Being a Girl Scout is something I’m very proud of and it taught me so many life lessons. I remember selling cookies door-to-door in my neighborhood of Sagrado Corazon in Puerto Rico and helping my daughters do the same where we live in Hoover. Girl Scout cookies are all the more sweet because of my long time affiliation with this wonderful organization. They truly do build girls with courage, confidence and character. Now…go buy some Girl Scout cookies! My junior sash with badges along with other Girl Scout memorabilia when I was a Girl Scout in Puerto Rico. I was a Cadette one year in Puerto Rico and attended Cadettes Under Canvas – a campout on the beach. Also featured is a patch from Camp Eliza Colberg where I spent many summers! My younger daughter, Emily, working at Girl scout summer camp in Shelby County while in high school. My older daughter, Anna Marie and her friend Leslie working at Camp KPC summer camp while in middle school. This entry was posted in Cookies, Girl Scouts, Wine and tagged Dessert Wines, Food and Wine, Girl Scout Cookies, Girl Scout Cookies and Wine Pairing, Perry's Steakhouse, Publix, Susi Zivanovich, Trader Joes, Vintage Wine Shoppe, Wine, World Market on March 12, 2018 by Southern Señora.